Are you tired of seeing the same drab, uninspiring office space every day? I’ve found that I’m most productive when I have elements of tranquility and zen in my work space. Thankfully, now I work from home and I’ve created an awesome zen inspired work space for myself. But I’ve also incorporated the same when I’ve worked in an office environment — and you can too. Whether you work in a shared space or in a single-worker area, I bet you can identify with the fact that offices sometimes feel sterile and uninspired. It’s time to get creative. With just a little effort, you can turn your office into an oasis of relaxation, tranquility and inspiration. Follow these 10 tips for creating your own work space retreat, and you’ll be enjoying your zen workflow soon! Keep in mind that you don’t have to undergo an entire office renovation to incorporate these creative office space ideas! And, you don’t have to do all 10 of these things to achieve an inspired space. Doing any, a few, or all of them will help you turn your workspace into a relaxing, productive place to work. Methodically look through all your desk drawers and cabinets, binning or safe-storing everything you haven’t touched for months or never used. There’s a direct correlation between productivity and clutter. Productivity and profits decline when clutter and chaos rise. Consider a social ‘chuck-it-out evening’ — accompanied by wine and take-out. Put useful items aside for charity. Use the same organization skills you would use in your kitchen! Aromatherapy probably isn’t the first tool you think of to help boost your productivity and grow your business — but maybe it should be. 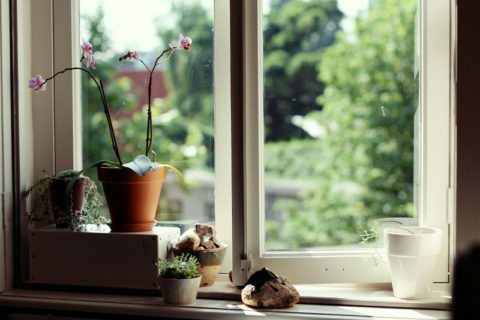 Another creative zen idea (that doesn’t cost a lot) is to add pleasant smells to your work space. Smell is the strongest of the senses and is best able to influence brain activity and memory. Wipe your desk and surfaces with cleaning products that smell really good. If they’re filled with natural oils, they’ll provide the benefits of aromatherapy . For example, many furniture polishes contain orange oil, lavender, or beeswax — all of which have pleasant scents and effective cleaning power. Even furniture that isn’t made of real wood will benefit from a loving touch with a natural fragrance polish. And you’ll enjoy those therapeutic aromas. Here are 6 scents to increase your productivity at work. Forget the wilting, leaf-dropped fig tree that takes up residence in every office! You can have an inspired creative office space — like I do — by adding live plants. I love orchids — like the one pictured here. Invest in a few tall, leafy plants to create a private garden around your desk, or add container gardens and succulents to your office space. They’ll offer natural privacy by blocking distractions around you. Just remember to water and spray-mist your office garden daily. And take the plants home when the office closes for extended periods. Here’s an idea… Initiate a best indoor garden competition, and encourage all of your colleagues to join in! Erect a few room dividers or screen dividers around your desk, only leaving open the space immediately behind your chair. Or, if you’d rather, add tall plants to achieve a natural screening effect. Purchased screens don’t need to look like office furniture either. For example, Egyptian and oriental painted dividers would be a fun twist. 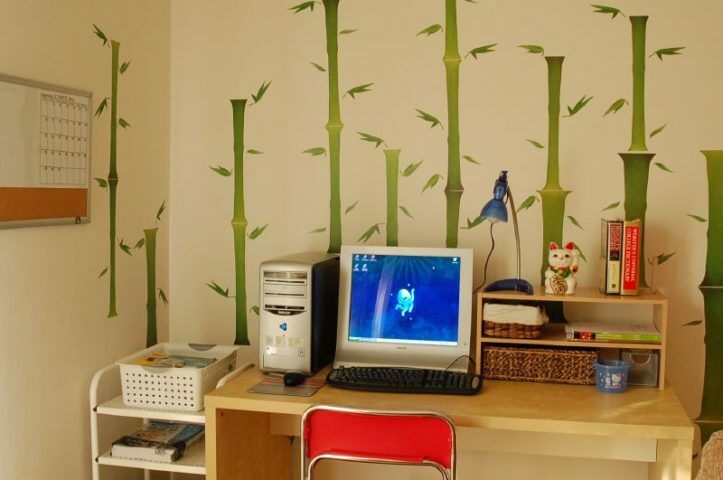 Or you could buy plain rattan screens for a minimalist approach. Partitioning off your small space creates a sense of security. Within your ‘walls’ you can add other home comforts and items that personally energize and motivate you. Try to introduce only natural fibers — so you’ll avoid an unhealthy static charge. Find some inspiration by looking at screen dividers on Pinterest first — before you decide on the best way to divide your office space. Assuming you have an accessible power outlet without trailing cables, install a percolator coffee pot or filter coffee machine within your private corner. Drinking coffee is very energizing. Even if you don’t drink coffee, the smell of a fresh brew can be relaxing — and motivating! There’s something natural that happens when most people catch the aroma of fresh brewed coffee. Keep bottled water on hand too. Dehydration is a major source of office fatigue — and teas & coffees won’t re-hydrate you. See how coffee breaks increase productivity at work. The very essence of comfort and relaxation is having a slightly indulgent chair. I highly recommend investing in an ergonomically-designed office chair. Contractors and interior designers can advise you on chairs that combine good posture and comfort. Trust me, you’ll be surprised at the difference a good chair can make! And if you have the space, consider adding a reclining leather chair (or at least a comfy chair and footstool) so you can take breaks away from your desk. 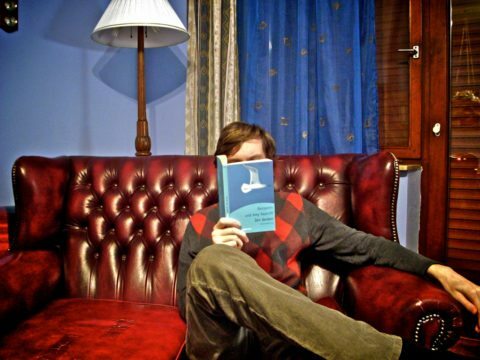 Use your ‘comfy corner’ for thinking and note-taking. See all of the ways you can make your work space more ergonomic. Are you alone in your office? If so, an iPod docking station is an absolute must. Calming background music while working enhances output for most people. I’m one of those people who always has music on in my work space. It calms me and keeps me motivated and focused. If you’re sharing a work space, try playing soothing music through headphones , but make colleagues aware that you can be interrupted — after all this is a workplace. You’ll want to make sure other workers can’t overhear your music. Check out the 8 best music streaming sites for work tunes. As anyone who vacations in the mountains will confirm, the invigorating effect of positive ions in the air can be dramatic. Buy quality ionizers for your work space. Even in a large office, sitting right next to a source of positive ions helps you breathe better and concentrate for longer. You can also buy mini-ionizers for neckwear — so you’ll notice the effects better and faster. Using a HEPA air filtration unit will keep dust particles, airborne bacteria, and viruses away from you. This means a healthier work environment overall. More about the difference between negative ions and positive ions and how they affect your productivity at work. Invest in a natural, soothing-shade rug for beneath your desk. Or maybe some wall-hangings for your partitions. Don’t clutter, simply enhance your work area by adding welcoming natural fibers to walls and floor spaces. Bring in a couple of understated photos and ornaments — but keep anything desk-based to a minimum. Choose 1 or 2 pieces that aren’t valuable but will inspire you with their zen flare. Here are 8 desk must-haves for your office. 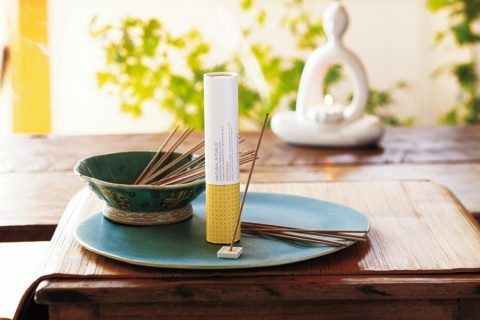 I’ve already mentioned how bringing aromatherapy oils, natural-scented candles (not synthetic fragrances, as these can irritate your eyes and sinuses), and flower essences into work can create a mini therapy retreat. You can also add computer monitor filters to protect your eyes from glare. And be sure to take breaks from the desk, if you’re looking at the screen for extended periods. Use these quick tricks to alleviate neck pain. Be sure to exercise at every available break. Here are some easy ways to get in a little exercise at work. A little thought, slight investment, and lots of creativity can turn your work space into a soothing retreat. Even the dullest workplace can be turned into a cozy, welcoming, and restful zen work haven — where inspiration can flow freely and easily. All it takes is a little imagination, time, and effort to totally transform your humdrum office space into an energizing retreat!